Sauteed Italian sausage, roasted red peppers and onions, drizzled with goat cheese and balsamic vinegar reduction sauce. Served with Italian Crostini. A freshly made mozzarella ball stuffed with creamy ricotta and parmesan served with extra olive oil, basil and cracked black pepper. 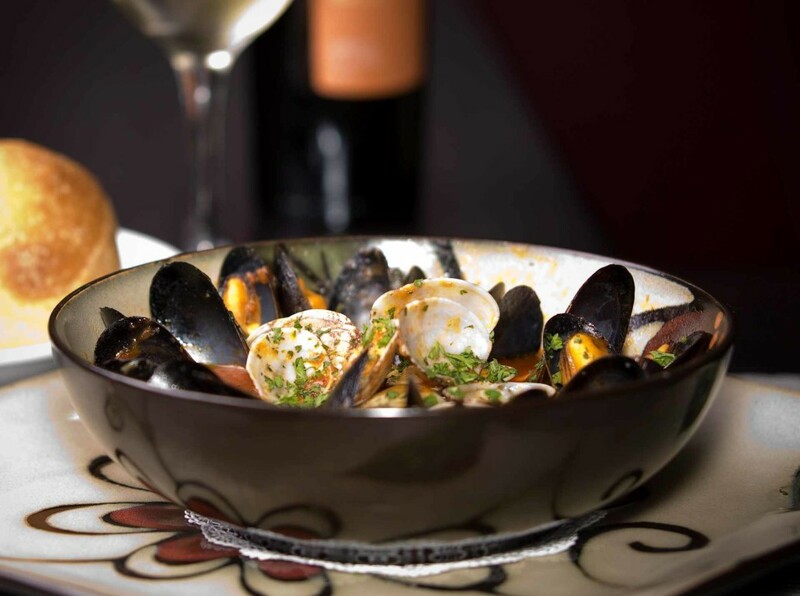 Sauteed black clams or mussels in your choice of white wine sauce or simmered in a fiery finish with our spicy Fra Diavola sauce. 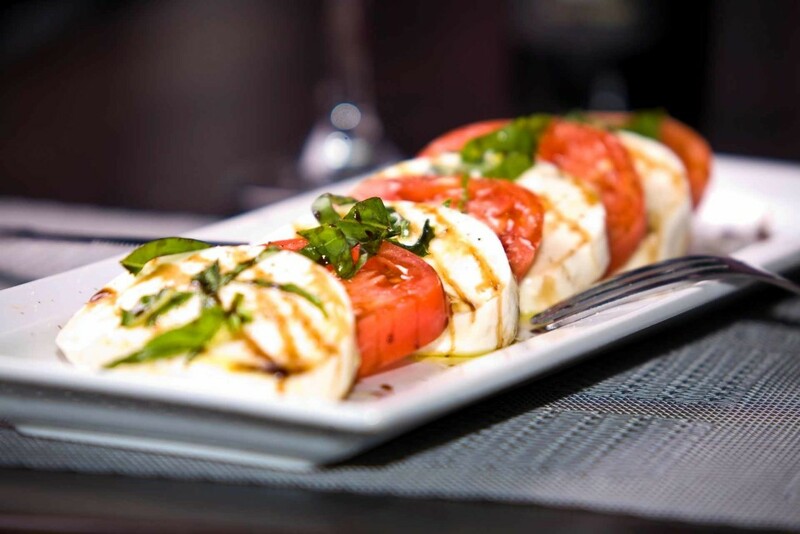 A beautiful presentation of fresh, locally grown sliced tomatoes, layered with Antonio’s mozzarella cheese, garden fresh basil, drizzled with a balsamic vinegar reduction sauce. Oven toasted homemade bread topped with extra virgin olive oil, freshly diced tomatoes, Antonio’s mozzarella cheese, basil and Italian seasoning. Chicken breast freshly grilled with Italian herbs, topped with cranberry goat cheese on a bed of mixed greens drizzed olive oil, salt and pepper and balsalmic reduction sauce. Mussells, clams, shrimp, salmon and lobster in a smooth creamy seafood broth. Fresh Spring Mix with toasted walnuts, beets, carrots, artichoke hearts and Gorgonzola cheese. Add chicken $4. Shrimp $6. Salmon $12. 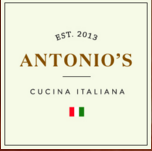 Fresh Romano with homemade garlic croutons tossed with Antonio’s Caesar dressing. Add fresh imported anchovies for $3.50. A traditional Italian soup made with great northern beans, fresh diced vegetables in a savory, seasoned broth. Bucantini pasta sauteed with smoked pancetta, onion, cherry tomatoes, sweet banana peppers in a mild spicy, white wine sauce Add Shrimp $8. Chicken or Sausage $6. Thinly sliced layers of fresh eggplant seasoned and baked in tomato sauce, parmesan and mozzarella. Served with a side of al dente angel hair pasta. A classic Neapolitan sauce of tomatoes, olive oil, fresh garlic, basil and Italian herbs. Add Home-made Meatballs for $4.50. Made with Antonio’s homemade creamy Parmesan sauce. Add Spinach $3, Chicken for $6 or Shrimp for $8. Angel hair pasta with roasted red peppers, sun-dried tomatoes, olives, capers, artichokes, sprinkled with olive oil & Romano cheese. Add chicken for $6 and Shrimp for $8. Made with imported Italian pancetta, white wine, fresh cream, onions, organic egg yolks. Italian dumplings with fresh pesto and cream sauce made with sun dried tomatoes and basil. Served with bolognese ragu sauce topped with fresh mozzarella and parmesan cheese. Italian cheese ravioli simmered in a creamy gorgonzola and tomoto sauce with wild, fresh shrimp. Chicken scallopine in a lemon, white wine and caper sauce, served with angel hair pasta. Fresh, tender chicken breast sautéed with mushrooms in a delicate marsala wine sauce over a bed of garlic and olive oil angel hair pasta. Milanese style chicken breast with smoked Italian ham, oven-baked with imported smoked provolone, served with a delicate mushroom-brown demi-glaze sauce over a bed of garlic and olive oil angel hair pasta. Tender chicken breast prepared with seasoned bread crumbs and baked in a light herb marinara sauce topped with fresh melted mozzarella over a bed of al dente angel hair pasta. 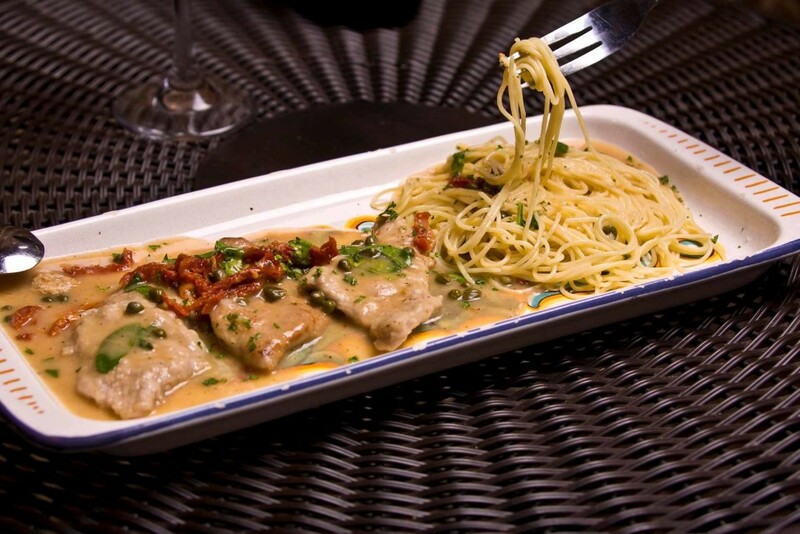 Veal scallopine in a lemon and white wine caper sauce, served on a bed of angel hair pasta. Tenderized veal sauteed with mushrooms in a delicate marsala wine sauce, served with a choice of pasta or sautéed local vegetable of the day. Tenderized veal with smoked Italian ham, oven baked with provolone cheese in a white demi-glaze sauce, served with garlic and olive oil angel hair pasta. Tenderized veal prepared with Italian seasoned bread crumbs and baked in a light herb marinara sauce topped with fresh mozzarella. Lobster filled ravioli sauteed in a creamy gorgonzola sauce, topped with shrimp. Salmon baked with Italian herbs and Gorgonzola cheese, drizzled with a balsamic vinegar. Served with a side of sautéed spinach. Sautéed shrimp, mussels, calamari and clams in a spicy Diavola or white wine sauce over a bed of al dente fettuccine. Spaghetti with sauteed clams and mussels in a garlic and olive oil sauce or red Diavola. Our deserts vary, please ask your server! Child’s portion of Fettuccine Alfredo. Add chicken for $4.00 or Shrimp for $6.00. Child’s portion of spaghetti and two meatballs. Child’s portion of our yummy cheese ravioli. Come Enjoy a Unique Fine Dining Experience, Visit The Depot/Speakeasy or set up off-site Catering!